Senske Lawn & Tree Care was featured on The Tonight Show with Jay Leno on April 22 as part of the “headlines” sketch where viewers submit newspaper headlines, signs and printed materials with spelling errors or other mistakes or sentence structures that make them funny. 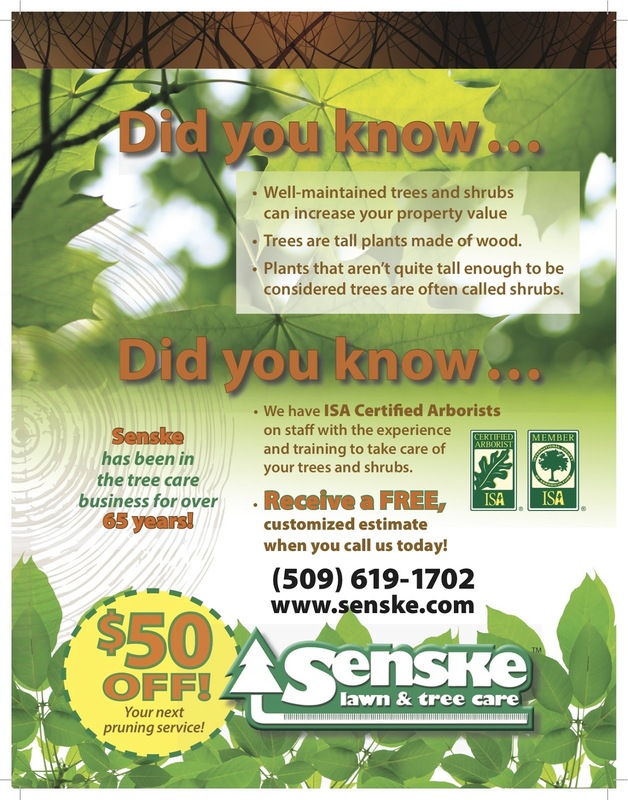 Senske Lawn & Tree Care’s now-famous pruning promo piece. Despite Leno calling the company “Senke Lawn & Garden” (which is not its name), Patrica “Patt” Mosley, director of marketing and communications for the $21.6 million firm based in Kennewick, Wash., was pleased with the exposure. We got in touch with her today for a quick Q&A. LM: Why did you go with a humorous approach to this promotional material? Patt Mosley (PM): Being new to the industry, this was my first pruning campaign, and when I started to think on how we could promote tree pruning in a manner that would entice the reader to actually pick up the insert and read it, I struggled in the beginning. What I needed to do was two-fold: First, find a way to “hook” the reader’s attention about trees and second, convey to them our expertise and knowledge with tree pruning (we have certified arborists on staff), and hope they connect the dots, meaning, they start thinking about their own trees on their property and realize they probably should get someone out to trim them. I decided on the “Did you know…” concept because I believe most people “want to know” and it gave me the ability to position both the hook and Senske as the subject matter expert at the same time. So I started looking for random facts about trees that did not necessarily have to be relevant to tree pruning per se, but just overall tree information. The factoids I chose to use were intended to be a quick read, amusing/interesting, but informational at the same time. Once I have the readers committed to picking up the insert to read it, then I felt they were committed to flipping it over to read more about our services and the promotion we were offering. It was definitely a different approach to take, but it did make tree pruning a bit more interesting! I will be honest, I honestly didn’t know all of these facts about trees before this, and it did make me laugh every time I looked at the piece. LM: Was the goal to get on the Tonight Show or was that just a surprise? PM: Not at all! When one of my colleagues sent us the link to the clip, I was actually worried at first, since I didn’t know what to expect. But when I saw it, even though Mr. Jay Leno referred to us incorrectly (Senske Lawn & Garden instead of Senske Lawn & Tree Care), it made my day. I actually had to watch a few more times and each time, it cracked me up. While I realize their intent was to poke fun at our expense, it was still worth the exposure and I can probably assume that more people today will remember that trees are tall plants made out of wood! LM: What has your clients’ reaction been? PM: So far, I have not heard much other than one of our customers had called a branch office to say they saw us featured on the Tonight Show. I know that many of our employees were excited to see the clip and the national exposure we received with it. LM: Have you seen an uptick in website traffic or phone calls? How about sales? PM: Right now, it is still pretty early. And as you well know, this is our peak season, so we have several campaigns running concurrently. Once the season run ends, I will be collecting and measuring the data to determine impact of each campaign, including the pruning one.